Stevenage space company Airbus has been commissioned by the European Space Agency to look into creating a future human base in the moon's orbit. 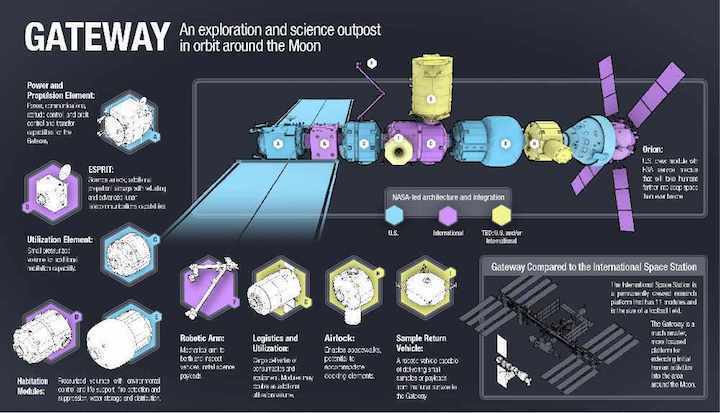 Over the next 15 months, scientists and engineers will develop a module for living in and research, although unlike the International Space Station, the 'Gateway' is not intended to be continually inhabited. In a second study, they will create proposals for refuelling, docking and telecommunications. Airbus is hoping that the project will eventually serve as a staging point and hub for human missions to the Moon or Mars. It's part of joint plans involving the US, Russian, Canadian, Japanese and European space agencies. NASA has plans to launch the first module into lunar orbit in the early 2020's. Oliver Juckenhöfel, Head of On-Orbit Services and Exploration at Airbus said: "The experience and know-how that ESA and Airbus have gained during flagship projects such as the Columbus space laboratory, the ATV space transporter and the European service module for Orion provide solid foundations for the studies. "When developing the new lunar platforms, robotic and human space exploration go hand in hand. Europe has a fantastic track record in both, and these two studies will help to ensure a strong European presence in future space exploration". David Parker, Director of Human and Robotic Exploration at ESA, added: "With these studies and other preparations, ESA aims to stay at the centre of human space exploration. The Gateway will become humanity's most remote research outpost and we hope Europe will benefit from the world of innovation, discovery and excitement that lies ahead".